United Microelectronics Corporation (UMC) filed a lawsuit against Micron Technology subsidiaries in China for patent infringements in January 2018, and demanded a compensation of RMB 270 million ($40.7 million). UMC also requested the court to order potential defendants to stop manufacturing, processing, importing, and selling the allegedly infringing products. Yesterday, Fuzhou Intermediate People’s Court of China issued a preliminary injunction against Micron, enjoining Micron from selling related items in China. DRAMeXchange, a division of TrendForce, expects that the global memory market may have a reshuffle if the judgment is enforced and other Chinese memory suppliers enter the market next year. Micron Technology offers Micron-branded products as well as Crucial-branded notebook DRAM modules and SSD. After this lawsuit, some of its PC DRAM and SSD products are facing a ban on sales in China. Micron still has the right to appeal, and the follow-up of this case is bound to become the focus of the global memory industry amid the critical stage for the US-China trade war. In addition, the production will formally begin in China’s domestic DRAM industry, adding to the tensions between the two countries. As a major DRAM supplier, Micron took the third place in the global DRAM revenue ranking for 1Q18 with a market share of 23%, following 45% of Samsung and 28% of SK Hynix, says DRAMeXchange. 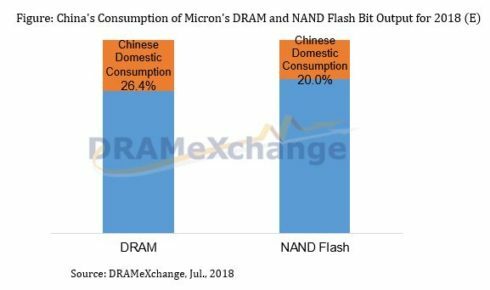 On the demand front, Chinese domestic market is expected to consume around 26% of the DRAM bit output of Micron, and 20% of global DRAM bit output in 2018 as China remains the world’s second-largest economy. If the judgment is enforced in the future, Micron will be prohibited from selling some of its memory products in China. This is bound to influence the company’s revenue performance, which would directly benefit its competitors including Samsung, SK Hynix, as well as Innotron (Hefei Chang Xin) and JHICC who are expected to enter the market formally in 2019. The judgment issued on July 3rd not only banned the sales of some Micron-branded and Crucial-branded products in China, but also ordered Micron’s IC assembly/testing plant in Xi’an to halt operation; Micron Technology (Shanghai) Co., Ltd. has also been ordered to cease sales. The judgment will have significant impacts on the sales of products under Micron’s own brand or the Crucial brand in China. Moreover, the businesses of Micron’s downstream partners would also be affected.